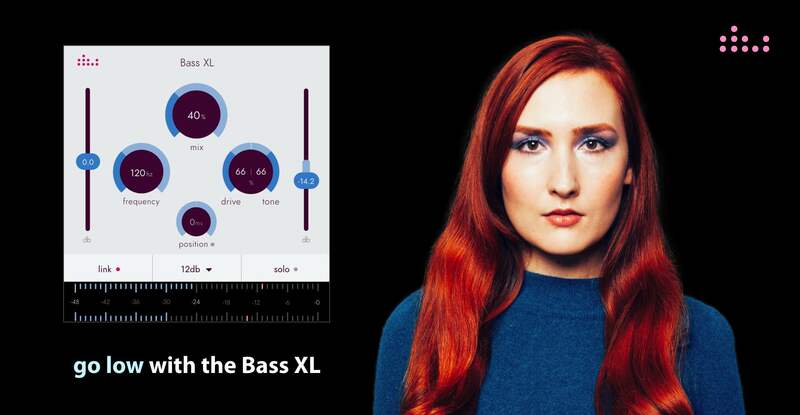 Denise is happy to launch the Bass XL, a plugin for creating a massive yet controlled low end for your track in seconds: compression and EQ, eat your heart out. The Bass XL is great for creating consistent weight and presence for your mix. Enhance a kick drum, drum sub mix, percussion track or melodic content like a rhodes, guitar or bass. The great power in the plugin comes from the drive and tone controls which give you a fine grained control over the harmonics and saturation of your sound. The Bass XL is easy to work with: Choose which frequency to boost, apply the boost with the mix control and then choose a filter slope to set the width of the boost. Steep slopes accentuate the harmonic content, a lighter slope accentuates the frequency band. Drive and colour the sound with the tone control. Repeat steps until happy with the results. Tone dial: For full control over the character and color of your boost. Volume independent drive: For a consistent sound in dynamic tracks. Ability to solo the added bass for reference or apply additional effects like saturation or distortion. Different filter slopes for a defined sound. This plugin is now available as a trial and full version on the denise website in VST/VST3/AU formats and priced at €29 (incl. vat) and $27 (excl. vat): denise/special/BassXL.